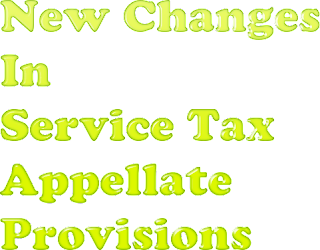 Section 86 has been amended to prescribe that remedy against the order passed by Commissioner (Appeal), in a matter involving rebate of Service Tax, shall lie in terms of section 35EE of the Central Excise Act. It is also been provided that all appeals filed in Tribunal after the date the Finance Act, 2012 came into effect and pending on the date when the Finance Bill, 2015 receives assent of the President shall be transferred and dealt in accordance with section 35EE of the Central Excise Act. (1) The remedy of appeal to Tribunal u/s 86 is not available in every case as it has now been provided subject to the saving clause ‘save as otherwise provided herein’. The provisos added provide that saving. Thus, scope of section 86 has been curtailed. (2) Any appeal against the order of Commissioner (Appeal) in relation to matters concerning rebate of Service Tax (e.g. exports) shall be governed in terms of section 35EE of Central Excise Act, 1944. (3) This appellate remedy would cover only orders passed u/s 85 of the Finance Act, 1994, i.e. orders passed by Commissioner (Appeals). What would happen to cases adjudicated by the Executive Commissioner (Adjudication) has not been provided for. used in provision of such exported service, shall be dealt with as per section 35EE of Central Excise Act, 1944. (5) Such appeals as filed before Appellate Tribunal between 1.7.2012 and date of enactment of Finance Act, 2015 (14.05.2015) and pending before Tribunal as on date of enactment of Finance Act, 2015(14.05.2015) shall be transferred to and dealt with as per section 35EE of Central Excise Act, 1944, i.e., Tribunal will not deal with appeals of rebate as stipulated above any more from the date of enactment of Finance Act, 2015 (14.05.2015). 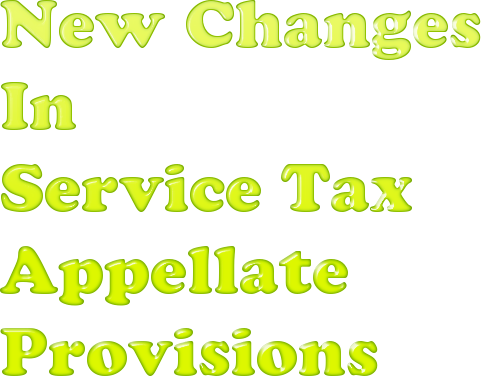 Section 35EE of Central Excise Act, 1944 provides for revision by Central Government. Application in such cases shall be made to Central Government within three months from the date of communication to the applicant of the order against which the application in made. The said period can be further extended by three months if Government is satisfied that the applicant was prevented by sufficient cause from presenting the application within stipulated period. Central Government can also on its own motion, annul or modify any order.